I'm very happy to present guest post, by my friend Matt Rennels, who reviews Jeff Goins' new book The Art of Work, which I'm keen to read myself. Once upon a time, Matt, my husband and I lived in the same town, worked at the same newspaper and worshipped at the same church. Matt is passionate about exploring how his faith intersects with his other interests, such as mental illness and overcoming fear. On the topic of careers, Matt also has an excellent post for idealists dissatisfied with their seemingly mundane careers, which I highly recommend you check out after reading his review. 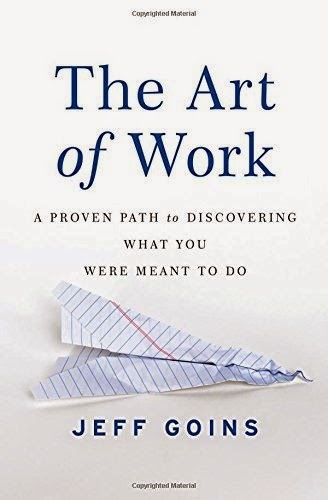 If Ginny Phang can find the silver lining of her life’s work in the face of bleak circumstances, so can the rest of us, Jeff Goins writes in The Art of Work: A Proven Path to Discovering What You Were Meant to Do. Phang was about to be a young single mother in Singapore. Not only did she face social ostracism and eviction from her parents' house, Phang had no job experience and her boyfriend planned to leave her if she had the baby. Phang’s gripping story is one of many in Goin’s new book. Art of Work weaves together a collaborative mix of people who have looked past various personal challenges and roadblocks to see something glimmering in the distance. What do they see? Purpose. Calling. Opportunity. Phang eventually found her calling, Goins writes, though not right away. With the help on an aunt, she had her child and found a job that paid the bills and gave her the flexibility she needed. However, boredom with her job led her to opening an online store selling T-shirts and other products advocating breast cancer awareness. She also found community with other single mothers online. Goins brings another layer to the discussion which is the ultimate purpose of this book. Sometimes we don’t pick our calling as much as our calling picks us, and it is usually a collaboration of several aspects of our life. Phang merged her online business experience with what she was learning in her community of mothers, namely, about doulas, which are birth coaches that helps pregnant mothers create a plan for their child’s birth. Finding our calling also includes circumstances. In Phang's case, her aunt told her to flush the abortion pills and she’d help take care of the baby. A close friend taught her the ropes of being a doula. And finally, since rent is so high in Singapore Phang needed a roommate, and hers just happened to have talent as a film maker. He created a documentary of Phang that spread and led to her becoming an authority on doulas and making appearances on national television. So Goins argues that we don’t find our life’s calling by picking up a clipboard and marking from a list of occupations. Phang is proof. She bravely lived her life and found her calling along the way. In addition to its compelling stories, The Art of Work is excellent writing by Goins, whom I’ve been following for some time. I found Goins thanks to my own interest in becoming a professional writer. Previously, Goins’ focus had been helping writers find their voice and their tribe. His writing normally featured his own personal accounts with others’ stories sprinkled in, but his newest book is the opposite, featuring others’ accounts with his own very lightly dashed in. As a master story teller, Goins intersperses lesser known people, like Phang, with anecdotes about Steve Jobs' early career. I would recommend it to anyone who is struggling to find their “life’s work,” and also anyone who has believed that God has placed a calling on their life but they don’t know what it is. Because, as Goins writes, there is a good chance they are in it right now. Matthew Rennels writes about mental illness, particularly bipolar, anxieties and depression, but at the core of his writing is the tight rope balancing walk between fear and faith. He currently lives in Florida with his wife and two dogs and he is a world renowned rock skipper. His writing can be found on his website, www.matthewrennels.com. He also has a podcast, 'Fear Less,' which is also on iTunes.